A black and white photograph of Florence and Leopold Amery at Waterloo Station, London, England. Mr. and Mrs. Amery are leaving on a tour of the British Colonies. Mr. Amery was Britain's Colonial Secretary and Mrs. Amery was the former Florence Greenwood of Whitby, sister of Hamar Greenwood. 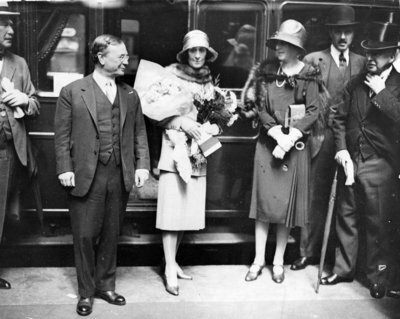 Left to right: Leopold Amery, Florence Amery, Mayoress of London, Lord Mayor of London. Florence and Leopold Amery, January 1928, Keystone View Company. Whitby Archives 32-000-033.